Thanks to genog for this one! 22 oz. bomber poured into a pint glass. Pours a clear tinted golden color with a fluffy white two finger head that quickly dies down to a bubble filled thin layer. Not much lacing or stickiness at all. Smell is a sweet but not overpowering candy like odor. A very nice clean citrus hop is mixed in there as well. Taste was very surprising for a wheat ale. I've heard its quite hoppy for this style, but wow. Taste starts of with a strong amarillo hop bite but is quickly taken back by the wheat. A tiny bit of bready malt comes to the tongue in the aftertaste, could probably use a bit more IMO. Mouthfeel is light/medium bodied with the perfect amount of carbonation, love how this one feels. I could easily put these down on a hot summer day, or any day. I definitely need to trade for this one again. This style is slowly growing on me. 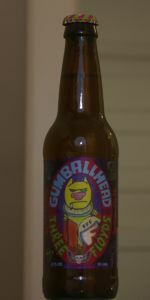 Tough to decide between this and Southern Tier Hop Sun, but I think Gumballhead has the slight edge. 12 oz. bottle poured into a Three Floyds tulip shaped pint glass. It pours a slightly hazy gold or honey with a disappointing 1 finger head that dies pretty quickly and doesn't leave much lace. Barely a cluster of bubbles remain on the beer surface. The nose is an instant a reminder as anything of the power an beauty of the Amarillo hop. It's just bursting with juicy grapefruit hop goodness but still manages not to be too resiny or heavy. The only thing holding me back from a 5 is a tiny solvent smell at the back end. The flavor start off with a moderate grapefruit hoppiness. It isn't nearly as strong as the nose would suggest. I'm also getting just a hint of peach as well. The flavor does seem to kind of drop off in the middle of the sip and ends with a void. It's kind of weird. the bodi is light to medium with an aggressive carbonation level to make it seem lighter. The mouthfeel also has a texture of what I associate with a decent percentage of wheat malt used. It's kind of creamy and slick but not in a bad way, it's just what have recognized as a common trait in most beers with wheat. It's highly drinkable though and I can surely understand why there is such demand for this beer. Overall a really nice everyday beer. Picked up on a recent trip to Kentucky/Ohio and brought back with me to Kansas City. Part of an entire trunk load of beers I brought back. I kind of thought of myself as a modern day Smokey and the Bandit, just not as cool. And 1000 miles north, going the opposite direction. And what I did was totally legal. And I was in a Ford C-Max. But other than all that, pretty much the same thing. Appearance- Pours a beautiful clear yellow with a soapy one finger head that dissipates quickly but leaves solid lacing. Smell - The nose is probably this beers strongest feature, in that you can smell the hops and wheat coming through, as well as some other fruitiness. Maybe a little lemony bitterness in there as well. Taste - Didn't quite follow the nose exactly, but close. You still get the good hop flavoring at the back end. Great wheat and hops balance, really like the intermixing of the flavors here. Mouthfeel - Finishes like a pale wheat ale should. Real smooth, good flavor blend, great session beer. You could drink a lot of these and not realize it. I got to try this out one night on tap, but the others I tried before ruined my palate. Now that I've had a 22 oz. bomber, I can say this is one fo the best wheat or pale ale, let alone wheat pale ale. Very very easy to consume. Nice balance of malts and hops, just one great beer to consume . . . over and over. a - poured a four fingers thick head into a large weizen glass. body is clear and golden, very vibrant looking. the head is thick, pillowy and white that leaves a thick lacing and sheeting throughout. s - understated hops and malt. hints of pine and sweet gum. t - orange and lemon zest. m - creamy and slick mouthfeel that finishes very clean. Three bottles of this brew magically fell into my possession after one of my buddies returned from an expedition to FFF. I don't know how I got so lucky, but I'll take it! Poured into a Weizen glass with a perfect inch and a half almost white head, which leaves a little bit of lacing behind. The liquid is a clear golden color, with a ton of bubbles rising constantly. The nose is made up mostly of pine sap, with a bit of candied grapefruit. There is also actually a certain bubble gum-like quality to it, which is very nice, since I love bubble gum. The pine sap recedes into the background with warming and the other scents become more powerful. Mostly, the nose is packed with mouth-watering sweet fruits and candy. On the palate, tropical fruit notes provide a nice complement to the wheat. It has that candied pineapple flavor that I love so much, as well as ruby red grapefruit. There is a great deal of spicy crispness. The finish is bitter, but not exceedingly so. The wheat is subdued, and provides a nice background for the hops, which is why i like this more than any other wheat beer I've had. Mouthfeel is light, with a fair amount of carbonation. And it really doesn't get much more drinkable than this. This beer is so good, I would drink it all the time if I could. Got this one as an extra from a generous trader! Drank from my CCB snifter. A- Pours hazy gold in color. A big white head from a semi-aggressive pour. Nice retention and some moderate lacing left behind. S- Piney hops up front with hints of citus that follows. A sweetnees is present, would almost guess honey. Very floral!! T- MMM...nice mellow hops. Not overly aggressive or bitter! It's perfectly balanced with malts, slight citrus take, and what I'm guessing is honey. Not a big wheat presence. As in the nose, I'm def getting a strong floral presence, I believe it's lavander. M- Nice and refreshing. A nice clean finish that leaves me wanting MORE and MORE of this beer. D- Unlike any wheat brew I have ever tried. It's EASILY my favorite. Might not be the poster beer for the style, however, it's 10x better than any wheat I've had before. This would def be a go to brew for me! I could drink this all day!!! PERFECT 5 here! Thanks to MC for the random bottle. I've had this before, but I guess I just never took the time to review it. Golden-yellow color with nice clarity, with a foamy white head that retained as a ringlet, leaving patchy lacing on the glass. Grassy aroma, somewhat floral, with light notes of citrus and toasted wheat. The taste is, again, grassy, leafy, herbal, floral, very light notes of citrus pith, the malt bill bringing in toasted wheat and grain husks. Herbal finish with a nicely drying bitterness. Light-medium body with a moderate carbonation. Comes across almost like an APA, which is a good thing. Drinks nicely and pairs with pretty much whatever you're doing. Appearance - Dark tan/brown, monster froathy 3+ inch head, tons of lacing. Smell - Hops, pine, grapefruit,some yeast, pale wheat, some grassy/earthy spices. Slight malt aroma. Taste - Nice pieny hops mixed with some pale wheat is the first flavors. Malts comes in at the end and add a little boldness. Some mild earthy spices and a little added sugars give a little sweet flavor. Very balanced and lacks the typical skunky yeasty wheat flavor i dont enjoy from the style. Mouthfeel - Nice smooth and mild, easy on tounge with low ibu's and not much bitterness. Palette gets alot of remaining hops, malts, and yeast. Afertaste is wheaty, hoppy and dry. Overall - Wow this is really good. Balance is unreal along with great additon of the fruity hops, makes this a wonderful, low alcohol beer to drink. Im not a wheat ale fan but i sucked this brew down without a issue and would buy again. Fantastic, world class, and a must try, even if not a fan of the style. Beautiful, pristine white bubble bath head. Atop a glowing golden elixir. Nose is orange blossom, citrus Zealand bitter hops. Hints of mango are there as well. Tree sap and pine play a mild supporting role. Flavor profile is citrusy, bright, orangey l hop character followed by a bitter drying hop bite and finishing with a warm hug of wheat grain. Mouth feel is slightly sticky, but drinkable and with enough balance to offset the resinous notes with drying and juicy notes. Overall a very nice beer that I'd be happy to drinkmost days. This is my favorite summer beer. Incredible beer and if I'm not mistaken there's quite a hint of hops in this "summer wheat". Leave it to FFF to make a summer wheat better. Just an all around tasty summer beverage...or anytime for that matter. Nice clear golden color, thick 2 finger head, lots of carb streaming up. Fruity aroma, skittles, kind of astringent end to the aroma. Bitter taste up front, bitter taste in the middle, you guessed it, bitter at the end. Very pleasant though. More of a green, grassy, type of hop bitterness in the taste rather than the fruity hop presence on the nose. Very nice. Has that house malt backbone three floyds pales and IPAs all seem to carry. Another nice one here.